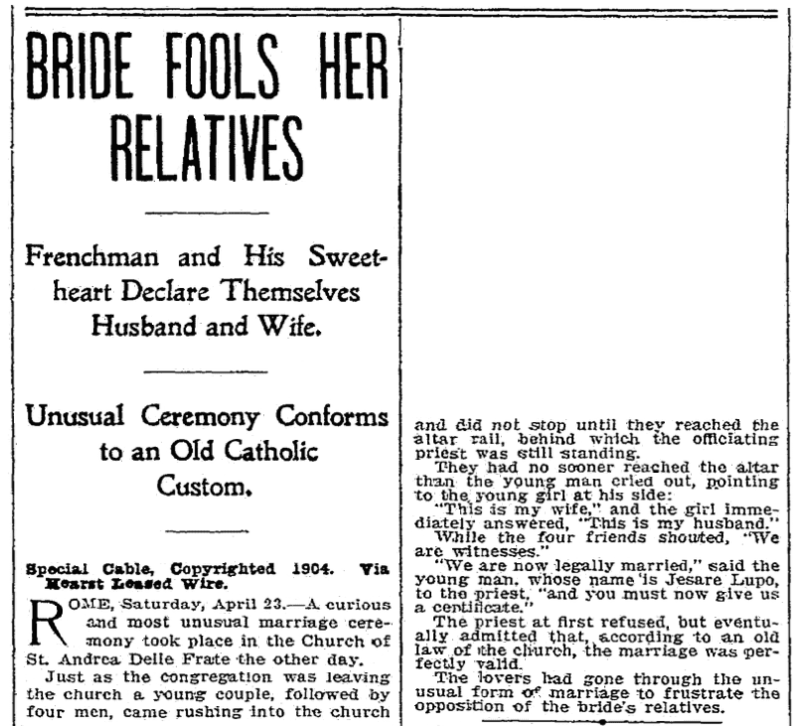 Introduction: In this article, Mary Harrell-Sesniak searches historical newspapers to find old laws, largely forgotten now, that once affected our ancestors’ lives. Mary is a genealogist, author and editor with a strong technology background. Growing up in Cincinnati, I remember hearing about an old law that forbade the running of pigs on Main Street. Although I looked, I’ve never been able to find it in the newspapers – but I do remember people laughing about it for quite some time. However, while searching GenealogyBank’s Historical Newspaper Archives for that old and forgotten Cincinnati law, I came across several other old laws that are startling – so I decided to share them with our readers. A few of these old laws even related directly to genealogy! If you were a prison guard in New Jersey, best not to let anyone escape – or you could be put to death! I would imagine that with a law that severe, they may have had a problem filling the position. At one time, if you were elected to public office and didn’t show up to do your duty, you were fined $10 every day you were absent from sessions of the House. 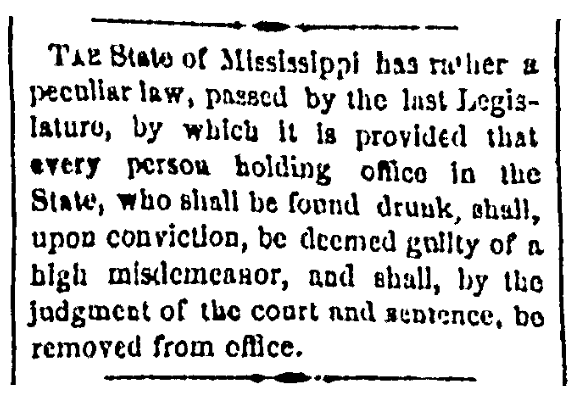 If you held public office in Mississippi in 1873, you were not allowed to be drunk. If convicted, a judge could remove you from office. 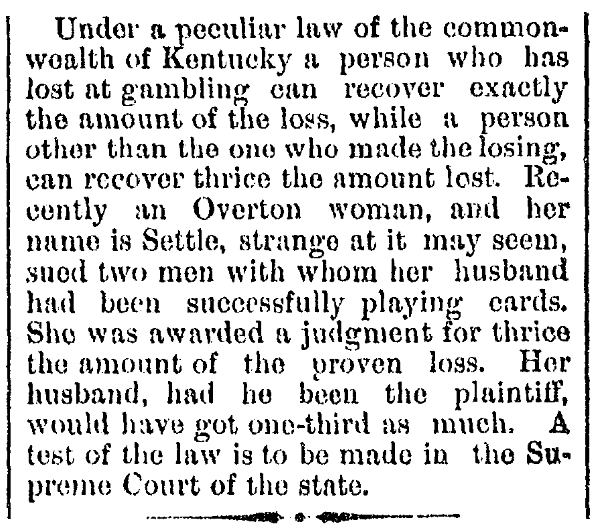 According to a “peculiar law” in Kentucky in 1882, if you gambled and lost, you could be given your money back – or if you were an injured party, you could sue for three times the loss. The wife of a gambler sued two men with whom the husband had played cards. Not surprisingly, this “gambling without risk” law went to the Supreme Court of Kentucky. Preventing horse thievery was an important activity, and in Pennsylvania there used to be a bounty of $20 plus mileage to anyone who arrested a horse thief. 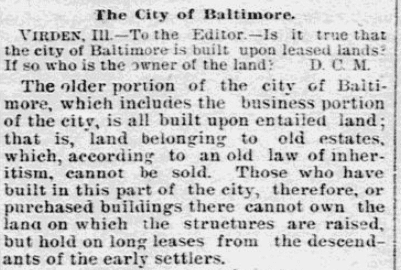 Interestingly, there was an early law in Baltimore regarding entailed land, or that which belonged to old estates. You weren’t allowed to sell it, so any business had to enter into a lease that passed to descendants of the early settlers. Ever hear that expression, to the victor goes the spoils? The concept of military prizes was actually spelled out in law. 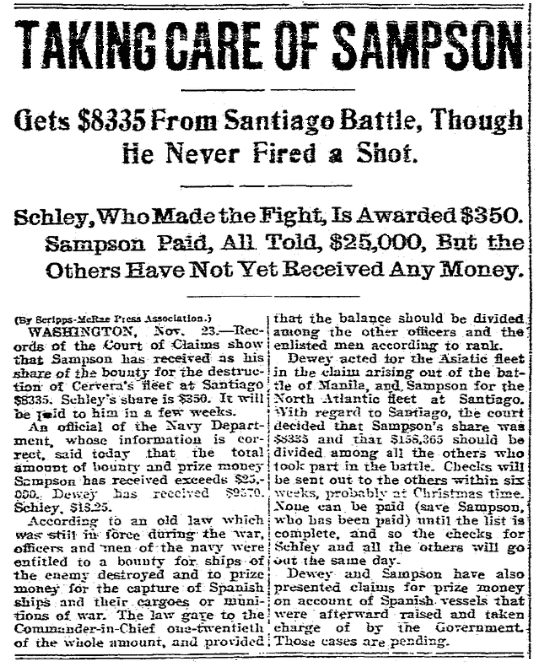 This article noted that in 1901, a commander-in-chief received 1/20 of the entire amount seized provided that the balance be divided among other officers and enlisted men according to rank. From what I’ve heard, there are many laws governing what you can or cannot do in the historical city of Venice. 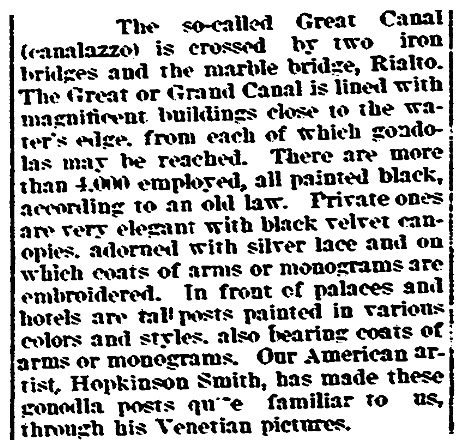 In 1897, a writer reported on the law that pertained to the color of the 4,000 gondolas. Black was required and private ones were elegant with black velvet canopies and coats of arms and monograms. This one may make the hair on many a family historian’s arms stick up straight. The College of Arms took it very seriously when someone used a coat of arms without permission. 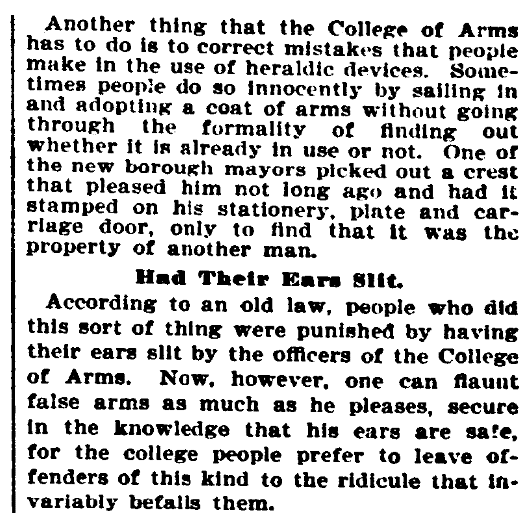 After a mayor improperly affixed one to a coffin, it was noted that the law allowed having one’s ears slit! Laws were location-dependent. Just because someone was compelled to do something in one location, in all likelihood it was different elsewhere. Laws usually change over time. New lawmakers put their own touch on a law, and when one is challenged it can even be overturned by the Supreme Court. But don’t let that stop you. Use old newspapers to examine laws at different times and places. You may find this adds an interesting aspect to your family history. These laws were very interesting. Maybe they should bring back some of them and enforce them! I agree. It would be great to bring some of these back. These articles are very interesting. I do research for my family and in-laws. Nice to see my hometown newspaper, “The Canton Repository,” in your review of strange laws. The Repository is still in publication. I was a delivery boy for the newspaper in the early ’50s. Thanks for writing. How fun to hear from someone who delivered one of these papers.